Antex Gascat 120P supplied in a convenient carry case. Applications include heavy duty soldering, localised brazing, heat shrink tubing, lead work repairs, cutting and sealing nylon rope. The tough nylon body contains a gas reservoir which can hold sufficient fuel for approximately 2 hours continuous use before refilling. Gas ignition is by means of a built-in piezo lighter. Tip temperature is variable, and is regulated by the nylon gas flow adjuster at the base of the unit. The iron is supplied with a 2.4mm chisel tip as standard. 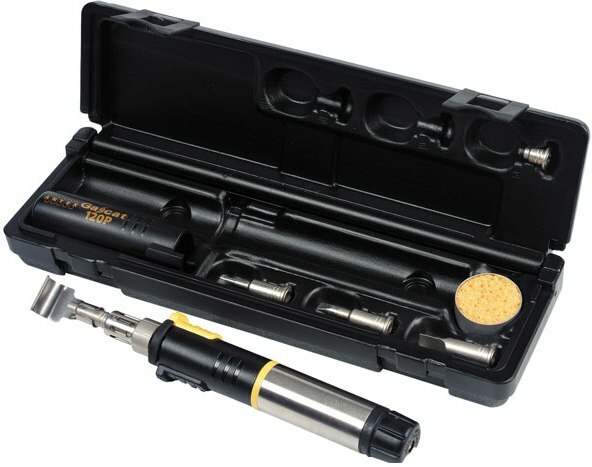 In kit form the iron is also supplied with a 4.8mm chisel tip, hot knife tip, blow torch, and a tip cleaning sponge.